Notting Hill may receive all the media attention, but there’s another equally long-running August Bank Holiday carnival celebrating Caribbean culture held in Leeds every year. 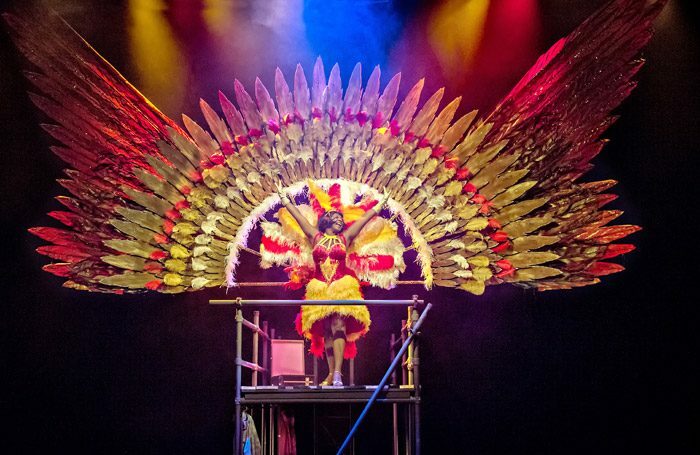 The Leeds Carnival, marking its 50th anniversary this year, is the subject of Colin Grant’s affectionate and celebratory play. Queen of Chapeltown was written by Grant after spending nearly 10 hours interviewing the founder members of the carnival – taking these interviews and shaping them into something that’s halfway between verbatim theatre and naturalistic dialogue. It tells the story of four Caribbean immigrants who arrived in Leeds in the mid 1960s to encounter an England simmering with racism and resentment and form the Carnival as a way to bring the community together. There’s a lot to fit in here in just over an hour, but the writing and performances are witty and warm. The easy banter between Raphael Bushay, Benjamin Cawley and Gabriel Paul is entertaining, but it’s Elexi Walker’s strong, determined Beverley who sticks in the memory, especially during a glorious dance routine to Nina Simone’s Four Women. Emma Williams’ rich costumes aside, this is a no-frills production, the scaffolding set doubling up as a Chapeltown bedsit – but there’s a huge amount of heart in Grant’s dialogue and characters. The ending feels slightly rushed, but when the steel drums kick in and ticker tape falls from the ceiling, the carnival atmosphere is palpable.